We are still not sure of the origin of the name of this stone. For some people, the name would come from the Medieval Latin "corneolus", coming from the latin "cornum" that is to say cherry dogwood. This name would have been given due to to its likeness with the fruit of the tree. For others, the name would come from the latin "caro" or "carnis", flesh, because of its color. At the time of Pline L'Ancien, it was called "Sard", coming from the city of Sardes in Libya, or from the Persian word "sered" meaning "reddish yellow". The carnelian stone is also known as the Mecca stone due to its color. You can sometimes find the expression stone of Sadoine, even if actually, this stone is different and a bit darker. The carnelian stone is a variety of transparent chalcedony with hues going from orange to red. The red hues are due to the impurities of iron oxide. Its color can be modifies by heating these impurities. You have to be careful when buying carnelian stones because you will find a lot of fake ones. Quite often, they are agates that were dyed in iron nitrate. The dyed agate often shows multicolor lines instead of a uniform carnelian. But it is quite tricky to see the difference. This stone was an important gem in all the civilizations of the world, or at least, in the places where you could find it. 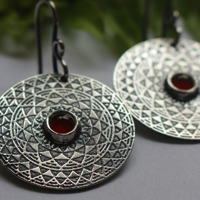 On the Neolithic site of Mehrgar in Pakistan (between 4000 and 5000 BC), perforated carnelians were found that could have been used as jewels. The carnelian was also found during the Minoan Bronze age in the palace of Cnossos in Crete. It was also very important for Sumerians as showed by the tumb of the Queen of Ur, Puabi, which treasure was filled with carnelian jewels dating back to 2600 BC. The carnelian stone is a deeply religious stone as the Egyptian goddess Isis would use it to protect dead people during their trip. This is how Egyptians engraved some parts of the Book of the Dead on carnelian amulets. They were meant to help having an easier access to the other world. It was also worn by architects in order to indicate their social status. Egyptians used to call it "sunset". 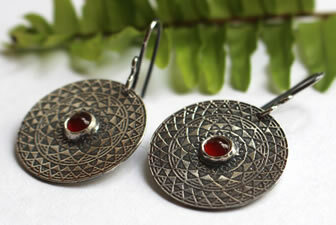 It is because of its red color and as a symbol of blood that this stone is so omnipresent in Egyptian beliefs. Romans would use carnelians a lot to make seals because the hot wax would not stick to this stone. It was also used to make jewels. You will mainly find rings with a carnelian that will be sculpted in the shape of a wild animal. It was meant to give protection and luck. 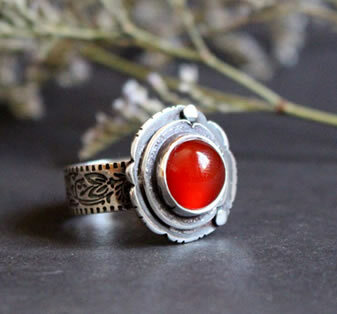 Greeks and Romans would wear signet rings with a carnelian. Some were engraved with numbers representing the god Sarapis or the goddess Isis who was both linked to time and death. Hebrews would think that the carnelian would protect them from the plague. It is also the symbol of the apostle Philip and it was one of the stone of Aaron’s breastplate as described in the Exodus. According to the archbishop of Mayence (1st century), it was the symbol of the martyr’s blood. 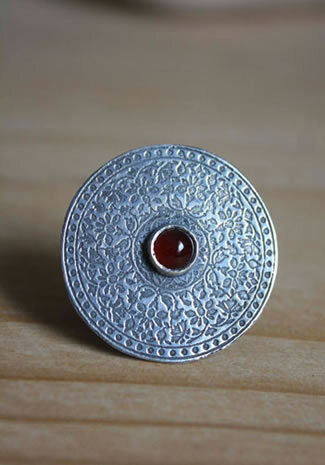 The seal of Mahomet is a sculpted carnelian, bezel set on a sterling silver ring. In the Arabian tradition, it was thought that the carnelian had the power to stop bleeding. Alchemists in the Middle-Ages would consider it as a hot stone, that is to say that it had the ability to activate the healing properties of the other stones. Today, Buddhists from China, India and Tibet, believe in the protecting powers of the carnelian stone and go on with the Egyptian tradition of having it bezel set with turquoise and lapis lazuli to increase its power. 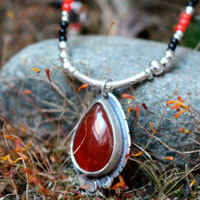 The carnelian would purify the blood and kidneys. This stone would get rid of blockades and would counteract pain due to diseases such as fever, neuralgia, infections and muscle pains. It would be linked to sexuality. It would increase fertility. Because of its red color, it is associated with menstruation and would relieve pains from it. The carnelian would regenerate the skin. It would relieve muscle pains, sores and would help fighting against arthritis and rheumatism. It would be useful for hepatic infections and the pancreas. It would help lowering high rates of cholesterol and triglycerides. It would help to fight against digestion problems and abdominal pains. It would act on uric acid levels. The carnelian is the stone of creativity.